This talk outlines some tactical steps I (and my team) have taken to get our clients to rank on the first page of Google search results. I’ll probably build it into a full-fledged blog post sometime over the next few months—but why make you wait until then? Here’s the slides, plus some extra info below based on some questions that came up during the talk. How do you possibly write a 2,500-word blog post? The longer your post, the more synonyms and related words you can use (a win for search engines). Solving difficult problems takes thoroughness, which usually takes words. The more useful your content is, the more likely it is that people will reference it from their websites—and backlinks are SEO gold. This post ranks #1 for “Christian apps.” It’s ~4,900 words. This post ranks #2 for “best Bible dictionaries.” It’s ~2,400 words. 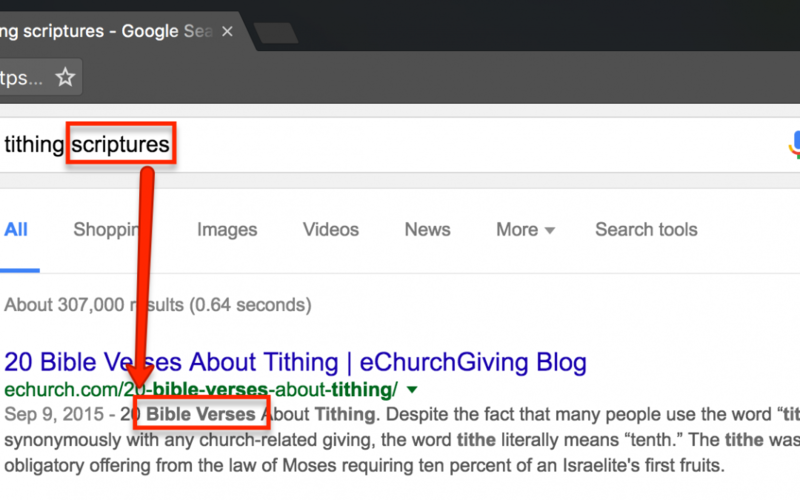 This post ranks #3 for “Sunday school lessons.” (That’s a crazy competitive search term!) It’s ~3,600 words. Yes, because: CTR (Click through rate) does affect how well a post ranks in Google’s algorithms. That means that if more people click your link from Google’s results, then it will favorably impact your rankings. No, because: There are so many more factors at play when Google is ranking your content. That means that if your Web page doesn’t deliver on its title, you’re probably not going to score too well on those other factors. For example, your bounce rate will go up. People will be less likely to link to your work. you get the idea. In summary: choose titles that include the keyword you want to rank for, and make them tantalizing enough to get people to click on them. And make sure that when those people show up at your content, you’re not letting them down.